Srinagar:While reacting to J&K Governor Mr. Satpal Malik’s statement that militants should not expect bouquets in exchange of bullets, AIP President Er. Rasheed has reiterated that Kashmiris want a peaceful resolution to the seventy year long political dispute and armed struggle is only outcome of New Delhi’s constant denial to resolve Kashmir dispute. In a statement issued today Er. 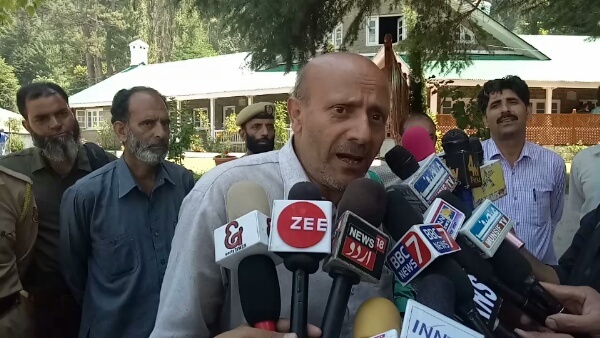 Rasheed said “Governor Mr. Malik needs to be reminded that on most of the occasions it is not militants but the security forces who initiate the encounters by conducting cordon and search operations and the pro-active policies of New Delhi are pushing youth to join militancy. While militants too must be knowing even without governor’s threat that no one will give them bouquets in exchange to bullets, New Delhi too should realize that Kashmiris will never bow before its might after being greeted with bullets, pallets and humiliations. Governor’s contradicting statements expose the lack of consistency and sincerity in the mind set of New Delhi.” Er. Rasheed added that it is nothing but state terrorism and denial of New Delhi that is pushing every Kashmiri to wall and thus the game of death and destruction seems to be endless. He said “New Delhi wants peace of its choice and timing but does not understand how difficult it is for every Kashmiri to bear the consequences of hard-line approach being adopted by New Delhi. Governor must understand that the lowest ever turn out in the recently concluded Municipal elections was not managed through the barrel of the gun by the militants but New Delhi’s constant designs of deception forced masses not to participate in these elections. It is high time for the governor to introspect and examine the real reason behind New Delhi’s failures in Kashmir rather trying to add salt to the injuries of masses. Kashmiris never expected bouquets from New Delhi but have unfortunately always seen the ugly face of deep state”.